The most expensive Rolex watch to date is certainly the extravagant and extremely rare Rolex GMT Master Ice men’s wristwatch. 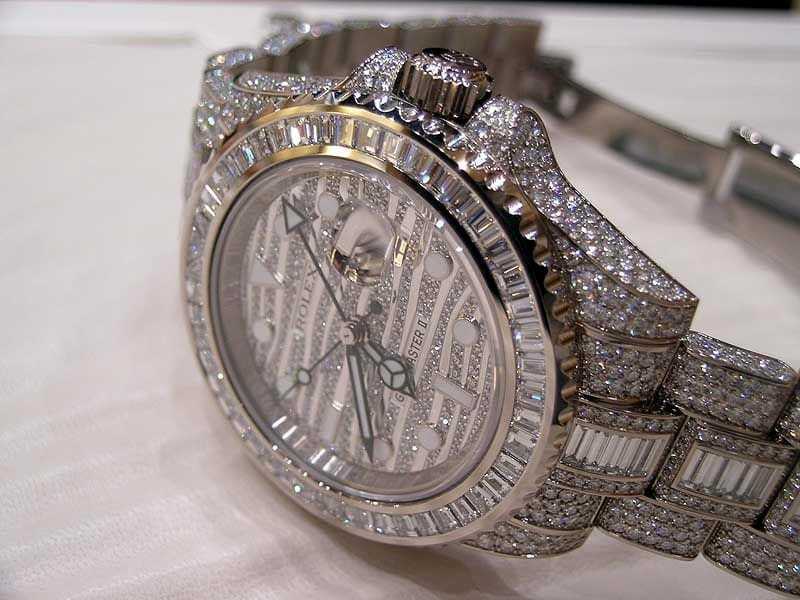 Market pricing has set the value of this particular timepiece around $485,350 USD. The Rolex GMT Master Ice wristwatch is certainly aesthetically stimulating and visually pleasing. It is made of some of the finest materials, including 18 ct white gold and nearly 30 carats of brilliantly cut diamonds that cover nearly every inch of the watch. 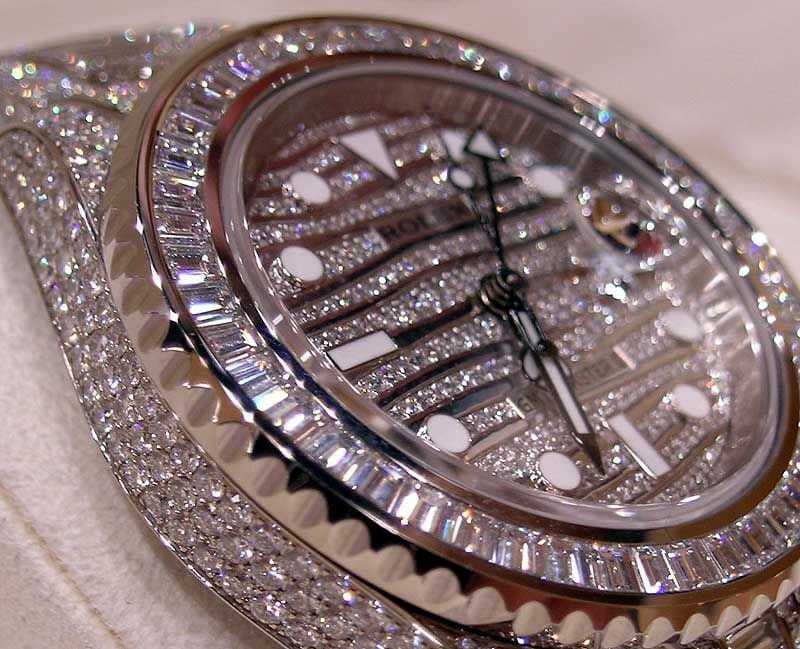 Though covered in diamonds, Rolex did not skimp on the watch’s key technological features that Rolex is known for. The watch features an 18 ct white gold case that has a thickness of 13 mm. This Oyster case, which utilizes a screw down Triplock winding crown and screw down case back, is able to withstand water pressure up to 100 meters (330 feet). Inside the waterproof case is the caliber 3186 self-winding automatic lever movement with 31 jewels. Though this is a self-winding movement, the watch does have a 50 hour power reserve. The dial features a date aperture at the 3 o’clock mark, while a black GMT 13 hour hand allows the wearer to set and view a second time zone. 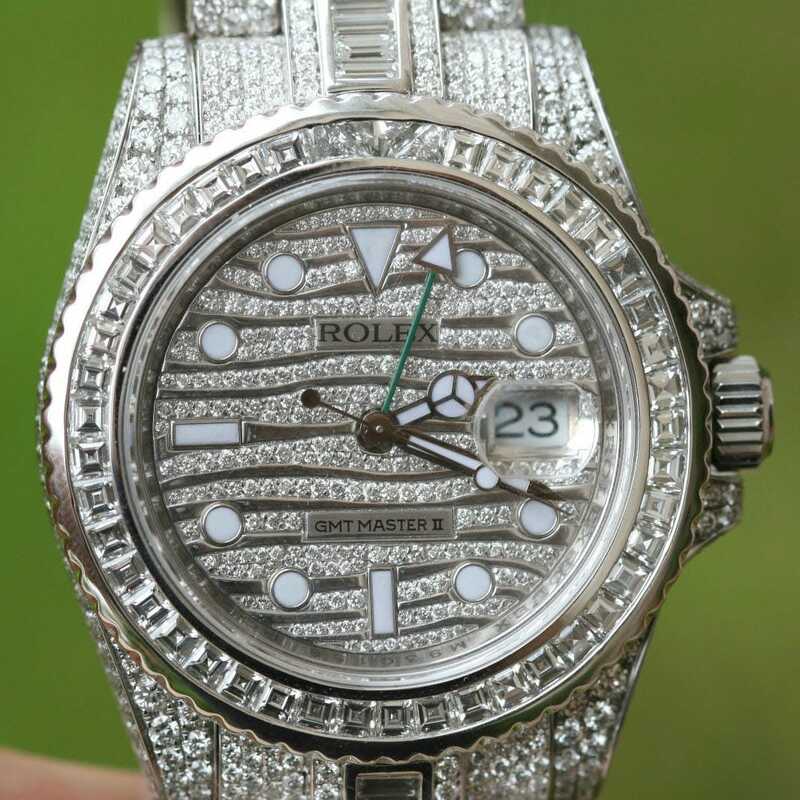 What makes this particular Rolex so visually appealing are the many brilliant diamonds that adorn the case, bracelet, dial, and bezel. The 18 ct white gold case and lugs are set with 79 round diamonds. The bezel, also made of 18 ct white gold, is set with baguette cut diamonds. The dial of the Rolex GMT Master Ice is one of its most striking features, with waves of small diamonds flowing on the dial face. Luminous hour markers and hands are lined in black to make them more legible. Atop the case is a scratch resistant sapphire crystal. 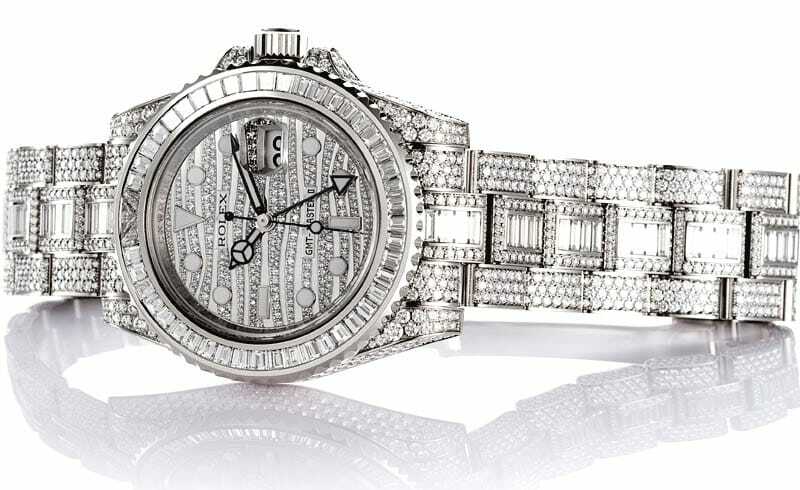 The timepiece is finished with a matching 18 ct white gold Oyster bracelet, completely covered with diamonds. The center links are covered in baguette cut diamonds, while the links on either side of the central link are covered in round brilliant diamonds. The bracelet is completed with an Oyster lock clasp, which ensures the watch remains securely on the wrist. Though extravagant, this timepiece also meets Rolex’s strict standards, offering advanced features like a date aperture and a waterproof case. This timepiece is also known for its precision, despite the clear effort that went into its visual design. The Rolex GMT Master Ice is really a perfect fusion of both extravagant luxury and technological innovation.